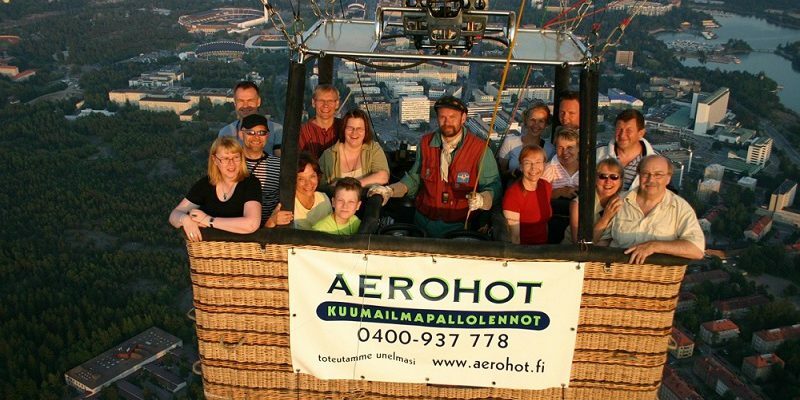 We arrange hot-air balloon flights over Helsinki and the nearby countryside. The flight season begins in spring from the middle of April and continues until mid September. Depending on the weather forecast during the flying season, we fly daily or when the weather is favorable. We meet and get ready for the balloon flight at the Malmi airport, to where we return by car after the flight. The flight course, as well as the flight take-off site depends on the direction of the wind. We set up the balloon together with the passengers at the take-off site. The flight itself takes about an hour and the entire trip takes about 4-5 hours. After landing, we pack the balloon together back into its trailer. After this, it is time for a picnic, which includes small salty and sweet snacks (including homemade bread). As part of the picnic, we arrange a baptism ceremony with champagne and all passengers receive an honorary title and a diploma according to ballooning traditions. Finally at the end of the trip, we return by car to the meeting place at Malmi airport. Hot-air balloon flights are flown during evenings because during the day thermals (columns of rising air) are created , which are not favorable for balloon flights. This is the reason why we meet for the trip about 4 hours before sunset. We often arrange hot-air balloon flights at sunrise during weekends as well. We also arrange flights according to agreement elsewhere in Finland. Welcome to the hot-air ballon flight of your dreams! You may purchase a special photograph of your flight!